We've got some more details on Sony's beefed-up VAIO Z series of laptops which were announced at CES, namely the addition of Quad SSD drives, Intel Core i7-620M processors and NVIDIA GeForce GT 330M chips. We already knew the two models would have a 13.1-inch LED backlit screen, an optical Blu-ray drive and HDMI-out, but new information is always appreciated. Made from carbon fibre and aluminum, the laptops weigh less than 1.45kg. Going back to those Quad SSD drives, you'll be capable of writing data in parallel on up to four SSDs at 6.2 times faster speeds than usual. 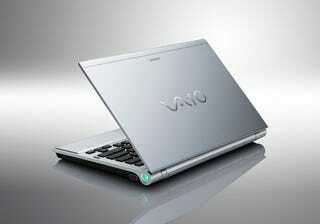 Two models are available for pre-ordering now, the VAIO VPCZ11Z9E and VAIO VPCZ11X9E. The main differences between the two are that the Z9E has a 2.66GHz chip but can handle an upgrade to 3.33GHz, has 6GB of DDR3 SDRAM and the Quad SSD has 256GB of storage. The 13.1-inch display is 1920 x 1080 and it weighs 1.43kg. The X9E has a 2.4GHz chip with upgrades to 2.93GHz, and 4GB DDR3 SDRAM with 128GB Quad SSD. The 13.1-inch screen isn't quite full HD, at 1600 x 900. It weighs a shade less than the Z9E, at 1.41kg. Both VAIO Z models will be on sale at the end of March, with prices starting at around $1,000.